The decisive question: How can Britain get a government with professional decision and strategy making capacities of the highest quality? After the upheaval of Brexit, which divided the nation, the election greatly added to Britain’s political chaos rather than ameliorating it. For a small regional party like the Irish Democratic Unionist Party (DUP) to determine who governs Britain in such a difficult situation, can only be considered a fluke of history, not the result of purposeful and effective design of the political system. The mayhem of the election outcome seems to reflect an increasingly chaotic world in which the most varied positions and beliefs clash with each other and in which no party seems to be able to offer a convincing view suitable to generate wider consensus in society on what the best policy solutions are. What Britain needs to do in order to sort out the political mayhem caused by Brexit and the election outcome is to go back to the basics of politics. Society needs to refocus on what it ultimately requires from its political system. Speculating on who will be governing in the future and when a new election might be necessary, does not generate a sustainable solution. It only extends the instability harming the nation. To provide stability and to unify the nation, Britain requires nothing more or less than an extremely qualified government free from any pre-conceived beliefs and dogmas, but simply bent on and fully capable of identifying and communicating the very best solutions for the nation on each and every political issue at stake. But here is the flaw. Unless British society improves some fundamental mechanisms of the political system, it simply will not get a government of the quality it urgently needs. Already in 2012, a Parliamentary Committee came to the devastating conclusion that government practically did not possess any professional strategy making capacity whatsoever. They formulated: “We have little confidence that Government policies are informed by a clear, coherent strategic approach, itself informed by a coherent assessment of the public’s aspirations and their perceptions of the national interest.” The parliamentarians emphasised that such lack of strategy making capacity in government would necessarily lead to faulty policies in all policy areas and, as a consequence, cause the greatest harm to the nation. Rather than concentrating on sound and solid policy making and on fixing this fundamental fault in the British political system, both, Cameron and May gambled, lost, and created chaos. What the nation has to realise, is that whichever person or party governs, whether May, Johnson, or Corbyn, whether Conservatives, Labour, or any other party, does not make much of a difference for the quality of policy making at all. As Anthony King and Ivor Crew describe in a book with the title “The blunders of our governments”, the history of politics in Britain over the past decades shows that governments formed by all parties are liable to severe blunders in their policy making. This will only change, if it is ensured that the governments formed by any party or politician possess decision and strategy making capacities of the greatest degree of professionalism and effectiveness. How can it be ensured that the country gets a government of the quality it requires? As a first step for creating an effective government and sorting out the present chaos, the nation or parliament ideally should select a person as the leader of the government and as Prime Minister who, objectively and independently of their party affiliation, possesses the most advanced qualifications in decision and strategy making. In the present quasi stalemate in parliament this would be a non-partisan approach by all politicians serving the nation best. Unfortunately, such a proposal may sound too unconventional and may not generate much support, even if, objectively seen, it appears to make sense. Especially the leader of a government must have a comprehensive grasp of professional decision and strategy making methods in order to guide the political system in the formulation of sound and effective policies. Independently of who is or will be nominated as the Head of Government in the future, a second step is indispensable: Government needs a system of some kind, let us call it an “advisory council”, which supports government in making use of the very best methods in decision and strategy making, such as for example the management sciences provide them. Government needs to know about and use problem solving tools provided by Operational Research, it needs to be familiar with systemic decision and strategy making methodologies, it needs to apply methods such as the Alternative Hierarchy Process in decision making, which induces government to clearly identify, weigh and prioritize goals exactly against which to evaluate its strategic alternatives. In the decision-making process on EU-membership for example until today there exists no clear listing of the goals of the country especially in terms of international co-operation, no weighing, and no prioritisation, against which to measure the different strategic options. Such deficits in strategy making are one reason why governments cannot come up with convincing solutions suitable to generate a far-reaching consensus and why they are unable to unite society behind a proposed solution. So far, like in most, if not all democracies, in Britain there is no institution which supervises the functioning of the political system. As a consequence, such fundamental deficits as the lack of decision and strategy making capacity in government identified by the Parliamentarians already in 2012, now five years ago, are not being fixed. The effects are constantly causing harm to society and threaten to increasingly destabilise the nation. Only if the political elite and society as a whole ensure that government has the necessary capacities in decision and strategy making and that government actually applies these capacities to the benefit of society, will Britain get political leadership of the quality the nation urgently requires. Only then will it get a government which can provide direction to society, join it together, and lead society effectively in an extremely complex world of 7.5 billion people. This entry was posted in Preconditions To Making Democracy Effective, Qualifications of Politicians, UK Constitution on June 12, 2017 by hpulrich. “Democracy is a religion that has failed the poor” states Giles Fraser in his weekly column “Loose Canon” in the British Guardian. Now, Giles Fraser is a highly intelligent man, a theologian and doctor of philosophy whose column, even if one may not always fully agree, generally contains some stimulating thought. But is democracy a “religion”? Certainly, Fraser’s thoughts contain some truth. He points out how piously we pursue a process – voting – even if we may not have any idea whatsoever who to vote for or may seriously wonder which difference our vote makes at all. Giles suggests (with Banerjee) that voting may simply be an “expression of one’s citizenship”. But then, this makes a mockery of human beings. If one believes in human beings as conscious architects of their world and lives, for them to pursue a more or less useless process which does not ensure a sound management of our nations and world is by no means adequate. In a way Fraser’s bias as a theologian is understandable. We all look at the world from our personal angle. Changing vantage points, exchange of views is necessary to arrive at the most suited perspective. To talk about democracy as a religion in fact appears highly disconcerting and even paralysing. If we want to make this world a better place, then we clearly need to adopt a more constructive stance, one of a kind which might come more naturally to managers or engineers: Rather than looking at democracy as a sombre force over which we have no influence, we need to consider democracy as what it ultimately is, as a man-made mechanism, which we need to improve, if it fails us. We, humanity constantly work on all kinds of systems, processes and mechanisms which do not fulfil our needs and expectations. Why not fix or improve the way we practice democracy? In which way is democracy actually failing us? Following the UK elections, many observers clearly highlight a deficit in the election process, it does not turn votes into adequate representation in parliament. Then there are the issues of devolution and “English votes for English Issues”: The structure of regional representation in the UK is unclear and needs to be overhauled. All in all, we need to check whether each element of the democratic system optimally fulfils the purpose it is meant to fulfil. Generally and perhaps most importantly, like in many democracies there is increasing disenfranchisement between the people and the political system. Democratic policy making needs to be changed in such a way in that it offer new channels for the public to engage in and to take adequate control of the management of public issues. True citizenship and stewardship for our world means shaping the processes with which we govern it. Since we as individuals do not have any influence, we must join with other citizens to make democracy work. Forming an association called “Citizens Controlling Democracy” will be crucial to ensure that our democratic policy making processes work effectively and represent the interest of all people in society. In a way we talk far to much, we publish hundreds of articles every week on what needs to happen in politics. If we do not take joint and constructive action to make democracy work, it never will. A machine which was considered adequate fifty years ago, may well not be adequate anymore for our world of seven billion people. It may have to be overhauled and re-engineered. Democracy – a “mechanism which needs to be fixed”. It would greatly help, if also theologians could adopt and support this perspective. This entry was posted in Countries and Democracy, Initiatives For Better Democracy, Reasons For Optimizing Democracy, UK Constitution on May 13, 2015 by hpulrich. The language which Dean Burnett uses in his article in the Guardian may be somewhat provocative, but it certainly gets a point across: We actually do not make sure that our politicians are qualified for the job. That makes us as citizens culprits, if things with our nations and world go wrong. It is greatly amazing: Everybody in their professional life needs to prove they fulfil a specific set of qualification requirements, any hair stylist, any sales manager, and any doctor. Just our politicians don’t, even if the fate of our entire countries, of our entire world, to a large degree our lives and the lives of future generations depend on their professional qualification. In democracies, it is us, the citizens, who govern. Not making sure that our politicians are qualified for the job is actually irresponsible. It will have effects on jobs, the stability of our nations, on international co-operation and peace, on how we handle the globe, even on the future of human dignity. So we, as citizens, must make sure politicians have the required qualifications for their tasks. We the citizens must take charge of our democracies. We must ensure they work properly. To do that we must establish an organisation: Citizens Controlling Democracy UK, for example. This organisation must write a precise job description for our politicians. It must identify clearly which specific qualifications are necessary to fulfil this task. It must make sure that each and every politician standing for election fulfils the specific qualifications required for their job. Our world of seven billion people cannot afford words only, it cannot afford cynicism about democracy and the “idiocy” of our politicians only. We must take constructive action. So who will join Citizens Controlling Democracy UK? This entry was posted in Uncategorized on May 13, 2015 by hpulrich. Many cooks, no dish – Without sound project management the UK will not get a new Constitution and a policy making system of the quality it urgently requires. The UK debate on democracy, political and constitutional reform is multifaceted, and long-standing. Some strands of it, such as the reform of the House of Lords, have been going on for years. The discussion is driven by actors from various reaches of society and state, including parliament, academic institutions, think tanks, and civil society, by actors departing from different starting points, with different perspectives, and interests. Contributors to the debate publish books, essays, assessments, commentaries, and opinion pieces. They organize conference, talks, party initiatives for more voter engagement, and parliamentary hearings on the issues. Following the Scottish vote on independence many participants in the debate presently push for a Constitutional Convention. Writers and activists increasingly use the new media. They write blogs (like this one), sometimes there are replies, but even two weeks later the author of a blog might not even be aware of it. The reason for the failure to generate a product of the highest quality conceivable appears to be that the talks are not structured. They are not managed effectively and efficiently in a joint effort. After years of debate there still is no joint perception even on the need for a new Constitution, no joint goals have been defined, consequently no joint diagnosis of the parameters affecting these goals has been carried out, and, as a result, no systems and processes have been designed to ensure that the goals connected with a new Constitution are achieved. Greatest urgency: People have to realize that setting up a new Constitution is a matter of the greatest urgency. There is no time anymore for activities which are not driven by the goal to generate a comprehensive result definitely fulfilling its purposes. The Citizens expect the political system to deliver. They are becoming impatient as the increasing support for protest parties shows. Any effort on the issue must be designed in such a way that it contributes without doubt to generating the very best Constitution and political system for the UK as soon as possible. Clear goal – clear deadline: People convinced of the need for a new Constitution must set themselves a clear goal and feasible deadline, such as drafting a new Constitution for the UK of the highest quality conceivable within a maximum of two years’ time (to suggest a concrete, potential goal). Joining of efforts necessary: People must realize that setting up a new Constitution and improved political system in a nation of 60 million people with many different concerns, views, and expectations is a gigantic, highly complex project which requires immense manpower and millions of pounds in financial resources. Individual persons, research institutes, or charities cannot accomplish the project in an adequate fashion by themselves. They need to join efforts and resources to generate a Constitution of the quality required. No adequate product without the very best problem solving and project management skills: People must realise that generating a new Constitution and overhauling the entire political system (while certainly maintaining what is good) is a highly complex task requiring the very best problem solving and project management skills. If people taking the initiative and wanting to drive the project forward lack these specific qualifications, the project is likely not to generate a product of the quality the Nation urgently requires. A “Peoples’ Commission on the UK Constitution”: To move the project forward the people concerned with issues of political and constitutional reform should, therefore, as soon as possible set up a joint working group, an independent “Peoples’ Commission on the UK Constitution” equipped with the necessary skills for managing the project. Parliament and its Political and Constitutional Reform Committee should help to set up this Commission, politicians should provide support and advice to its work where required. Since the work of politicians and the systems and processes within which they work will be under review, the politicians themselves, however, will not be able to lead the review process. The Commission must work directly on behalf of UK society and largely independently of the present political establishment. Independence: The Commission must operate independently from the present political system and only be responsible to the people. Best methods: The Commission must identify and be equipped with the best problems solving and project management know-how available. Best know-how: The Commission must solicit the best know-how available in the country and in the world to identify and recommend the most effective policy making systems and procedures, beginning with the assessment of and with recommendations on the voting system. It must operate in a completely open fashion and use “crowd-sourcing” as a means to identify the very best know-how available, right from the beginning of its work, in principle even already on the issue of what the best methods for tackling the task are. Creating joint perspectives: To generate the required support for the project in society the Commission must start by creating a joint perspective on the need for a new Constitution and on the various goals to be pursued by its review. Involvement of the people: Considering the increasing discontent of the people, it must be highlighted that the review of the UK Constitution and the work of the Commission provides people with a novel and far-reaching means to get involved in shaping and controlling their political system. They can take ownership of it. Involving the public thoroughly in shaping “their democratic policy making system” will reintroduce vitality into the democracy of the country and offers a valve for channelling discontent and potentially disruptive action into constructive contribution. Resources: Since the people are the highest sovereign in the nation and shaping their policy making system in the best way conceivable ultimately is their own concern and project, they basically must pay for the work of the Commission. Conveying this thought and the relevance of the project to the wider public is likely to take some time, however. The government and individual sponsors should, therefore, finance the work of the Commission to begin with (without compromising its independence in any way). Endowing the project with the necessary funds from public resources appears appropriate even in times of tight budgets, since the work of the Commission provides the foundations for maintaining the nation and the world in a sound state. Cost-benefit considerations will highlight that perhaps no other investment into the future is of greater relevance. Mechanisms offering the public the possibility to contribute required resources to the operation should, however, also be set-up from the beginning. Failure by Parliament (and/or Government) to establish the Commission on behalf of the people would risk contributing to the destabilisation of society, to the destruction of the world, and could well cause grave harm to the nation and its people. Education: Once the new Constitution has been designed and officially put into operation people need to be educated on how it operates and which means it offers for engaging with policy making in the nation. All in all citizen education needs to be stepped up to highlight the relevance of civic engagement in protecting freedom and human rights. Back to the fundamental question, whether the UK actually needs a new Constitution and a new, refurbished democratic policy making system. Some readers may still have doubts whether the proposed procedure is necessary at all. To assuage the discontent of the population with present democratic policy making by opening up new ways for citizens to engage constructively in the policy making process. Creating such a possibility for citizens involvement in policy making will contribute to ensuring the long term social stability of the country. A second purpose of the review process is to ensure the very best performance of the policy making system, so that it is capable to deal with the highly critical challenges of our time. The present policy making system contains severe systemic deficits compromising its performance. In 2012, as a crucial example, Parliamentarians diagnosed that the strategy making capacity of government, a central element of government policy making, is greatly defective, a factor, which in their view “has led to mistakes which are becoming evident in such areas as the Strategic Defence and Security Review (carrier policy), energy (electricity generation and renewables) and climate change…”. [ii] It will, in other words, affect the quality of policy making of government in most areas.In 2013 Anthony King and Ivor Crewe from the universities of Essex and Oxford published an in the meantime probably well-known book with the title “Blunders of our Governments”, a book which illustrates the consequences of such deficits in “real-life”. The book describes in detail how British governments since Margaret Thatcher have squandered billions of pounds on major projects and not achieved distinct policy aims. King and Crewe also suggest that the present government is by no means better qualified than the previous ones. The fact that all governments of the present and recent past commit such blunders correlates with the observation on the lacking strategy making capacity of government y the Parliamentarians and highlights the systemic nature of the deficit. Designing processes to eliminate this and other potential shortcomings in the policy making system would be of the greatest relevance for the economic and political stability of the Nation and for the well-being of its citizens. A new Constitution finally appears to be required as the foundation to re-build a coherent, sound, and strong society capable to protect well-being, freedom, and human rights in a time of ongoing globalization and technological change. Over the last decades Western democratic societies including the UK have turned into highly multicultural societies. Due to this development and to more liberal views on life in western nations in general the cohesion of society around shared values has greatly declined. Protecting well-being, freedom and human dignity in a thoroughly changing world as ours at the beginning of the 21st century will, however, demand great energy and ample resources, factors which only a society can muster in which citizens co-operate for the maintenance of these goals. Formulating the fundamental principles guiding society in a new Constitution will help building a society of the strength and resilience required to deal with the challenges of our time and the future. This is an aspect emanating already in the debate, but which, just like the other elements of writing a new Constitution, must be led to a defined result. A final word on “muddling-through”. Frequently one hears in the debate that the political culture in the UK would be bent on “muddling-through”, rather than on establishing purpose-made, effective processes for generating high quality results. Whether one believes this proposition to be true or not, given the increasing discontent with the present policy making system, the risks for the social and political stability of the Nation, the extraordinary challenges for humanity at the beginning of the 21st century, in any case by no means there appears to be any more scope for muddling through. We are obliged to preserve the Nation and the world in a good state for future generations. Given the complexity and urgency of the threats and challenges in the world of today, aiming for establishing the most effective and efficient policy making system conceivable appears to be the only permitted way forward. This entry was posted in Uncategorized on November 21, 2014 by hpulrich. How to make democracy work? From ideas to structured action. Words, thoughts and ideas are valuable, if we want to strengthen our democracies. But they do not suffice. 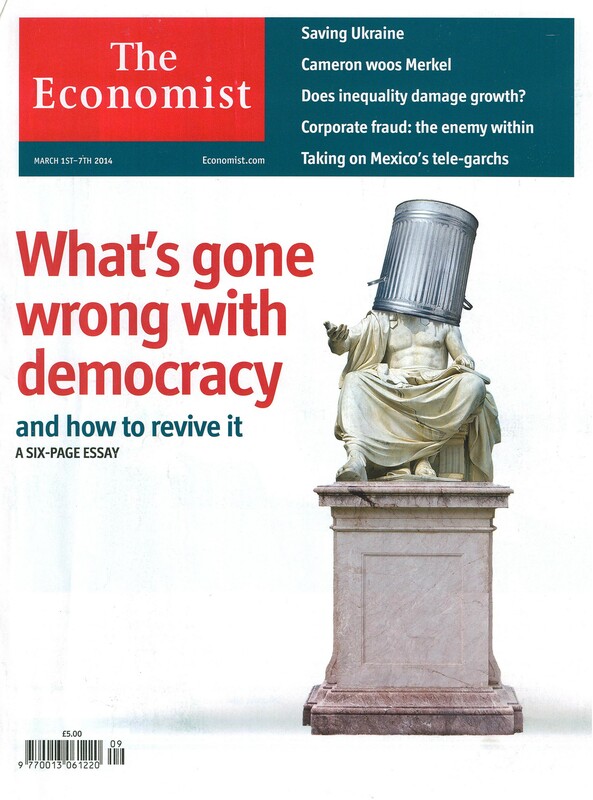 “What’s gone wrong with democracy – and how to revive it” asks the Economist in an essay in its March 1st – 7th edition. The concern of the article must be appreciated. Functioning democracies are of crucial relevance for the establishment and maintenance of well-being and freedom, for social stability and peace, and in fact for the maintenance of the earth. The Economist article raises many valid issues on the state of our democracies and suggests solutions to a wide variety of deficits. Unfortunately, the contribution which the article can make to reviving established democracies or to help establish flourishing democracies in crises countries appears very limited due to three deficits: First, the recommendations seem too general in parts, what does “nurturing democracy” the final recommendation in the article, mean precisely for example? What exactly is necessary? Second, the issues the article raises and its proposals are rather randomly selected, they lack a key, a structure. We suggest that in order to strengthen democracy we have to identify the drivers behind the health of democracy and address them systematically. Third, the essential major deficit, which so many articles on democracy share: The article fails to specify who exactly must take its suggestions on board, who precisely is to examine them and to take concrete action. Words, thoughts, and ideas do not cure our democracies. Making democracy work takes concrete action, by those who are concerned about democracy, by the writers on democracy, and in fact, since democracy is government “by” the people, by all of us. If we are concerned about the state of our democracies, we need to establish an infrastructure responsible to evaluate and implement the required measures to make democracy work. Anybody who has suggestions on how to strengthen democracy must realize that making suggestions does not make much sense without the infrastructure in place to process these proposals. So maybe we can induce the Economist to perhaps even spearhead concrete action to save and strengthen democracy around the world? If we are serious about making our democracies effective and saving our world, we all must think beyond our traditional frame of mind and activity. We must think and act as constituent and active elements of our democratic societies. If we are right with our suggestions on the deficits concerning the article by the Economist on democracy, what then might be a more suitable, concrete approach to making democracy work? The first fundamental, necessary step appears to be the establishment of a clearer joint understanding of what democracy is about. We suggest that democracy is a form of organizing the peaceful and productive co-existence of people in a society. Concretely it is joint decision and policy making by the people on public issues in such a society in an extremely complex world for the well-being of present and future generations. On the basis of this understanding of democracy, we suggest that the following fundamental building blocks and actions are necessary to establish functioning democracies. The foundation for a democracy is the readiness for peaceful and productive co-existence of human beings in a society. In order to ensure that such fruitful co-existence is possible, certain rules are necessary. According to the psychologist Maslow self-realization, however, is one of the highest aims of all human beings. To minimize the reduction of individual freedom by rules and regulations, only those rules should be put in place in society which are absolutely necessary for the peaceful and productive co-existence of people. The fundamental rule required for such co-existence is the Categorical Imperative. It means in its basic form that the freedom of people ends where the freedom of other people begins. The Imperative may suffice as a framework for the rules required in a society. Democracy means that, we, the people govern the affairs of society ourselves. We as citizens in a democratic nation must realize that democracy cannot mean electing governments and letting them make decisions and policies on our behalf, without us as citizens ensuring they perform their tasks effectively and efficiently. The privilege of freedom, which comes with democracy, demands that we ourselves are constantly involved ourselves in the process of governing the world. If we don’t use our freedom in controlling who governs us and how to govern the world, our freedom will be taken away from us. Uncontrolled power holders might destroy the world. We ourselves govern and are responsible for this world. We must make “our” democratic policy making systems work effectively, so they fulfil this responsibility for us. Even if democracy traditionally means that the majority decides, this cannot mean, as the Economist points out, that the majority dominates minorities and compromises their freedom and well-being beyond the limits and regulations which must apply evenly to all members of society. In a democracy everybody needs a fair and equal chance and should be involved in decision and policy making processes. Fairness is the minimum precondition to maintaining a stable society. The more the principle of fairness is superseded, however, by principles of co-operation and mutual support, the more productive will a society be. The better will the society of a nation or, in fact, global society fare. The Economist article suggests that the “key to a healthier state, in short, is a narrower state”. This appears to be an extreme attitude, as it is often also formulated by the Tea Party Movement in the United States (“starve the beast”). We suggest that in order to maintain a democracy in a healthy state we rather must identify the “optimal” scope of the tasks of the state. Where a state does not support individual citizens for example who need support, society as a whole might suffer. The “optimal” interplay between joint and individual action will benefit society most. In order to define such an optimal delineation between the tasks of the state and the obligations and rights of citizens we, the citizens of a democratic society, need an effective system to decide what precisely the tasks of the state and what the rights and obligations of citizens as private individuals should be. In most, if not all, democratic societies such an effective transparent system to delineate the tasks of the state and of private individuals will not yet exist. The aim of our joint decision and policy making in a democracy must be the well-being of people, not only of present, but also of future generations. We are obliged to maintain our societies and our world in a good state for future generations as well. Our policy making processes must be geared to take this into account. From looking at the state of our world we derive which level of quality our joint policy making processes must have. Our nations with millions or hundreds of millions of people -in the case of India and China more than a billion – and our world of seven billion people are extremely complex. Defeating poverty and hunger, creating jobs for millions of people, managing national and the global economies, protecting the entire world and human life, stopping the destruction of the world by global warming, creating and maintaining peace and co-operation are highly difficult tasks. Making democracy work, keeping people satisfied with its performance, and fulfilling our responsibilities to future generations, requires from us to set up the most effective systems conceivable for joint decision and policy making on public matters. No systems works without effective control. Our present control systems, however, do not work. Parliament as the main control system for example, is too much intertwined with government in parliamentary democracies, as one reason. No democratic policy making system works without the people themselves permanently checking what their elected leaders do. No democratic system will work effectively without a clear identification of faults and deficits and without an effective process to fix them in due time. As we highlighted already: Democracy is government by the people. Democracy will not work if the people themselves do not get engaged in permanently controlling, supervising, and, if necessary, re-shaping their democratic policy making system. In order to correct deficits of the present policy making system and to set-up the best democratic policy making system conceivable, we the people, the citizens of a democratic society, need the very best know-how available in our countries and in the world on these matters. We need to establish a suitable process or institution to assemble this know-how. The Economist, just like all of us, might have beneficial thoughts and proposals on how to make democracy work better. Whether these ideas are truly the best options, is a different and important question. If we want to optimize our policy making systems, we need effective processes and systems to evaluate these suggestions. We also need to communicate with citizens regularly on the options to improve our policy making systems and on necessary steps to implement such improvements. Establishing these processes takes resources. Citizens must join together to provide them. Functioning democratic policy making systems are of fundamental relevance for the life of everybody living in democratic nations. They also are crucial for our task of preserving the world for future generations. We as citizens should not refrain from making the resources available necessary for providing our society with proper policy making foundations. Providing these resources will easily pay off by making all our policy making more effective and efficient. Any proposals for improvement may, however, meet the objections and resistance of the existing government or individual segments of society in our country who benefit from the status-quo. If these four parameters are required to generate the most effective democratic policy making system conceivable, the question is, how do we ensure that these parameters are in place? On the issue of identifying the best processes for our democratic policy making system, we have to realize that our present process of discussing deficits and problem solutions randomly in the media or of researching policy making issues in hundreds of research institutes in a rather uncoordinated fashion is highly ineffective. While the destruction of our world goes on, while poverty rises and conflicts are not solved, our so far ineffective “solution generation” process wastes very precious time, often months or even years. Moreover, it very often does not generate good results at all. The task of identifying the best processes for an effective (and fair policy making system – something of the greatest relevance in the Ukraine at present) itself requires a suitable and highly effective infrastructure. It requires what we might call a “Citizens’ Know-How Institute on Public Policy”. As the Economist rightly points out, democracy is in a dire state around the world. We urgently need to make it work. If the Economist is serious about achieving this goal, here is a first concrete necessary action to which the journal could contribute in a critical fashion or in which it could even adopt a leading role: The Economist could take and promote steps to establish the required Citizens’ Know-How Institute. Given its standing and its experience in public communication, an institution like the Economist would have substantial assets in making this first necessary project work. As we said, know-how is only one necessary element of what is more generally required to make democracy work: Permanent and effective control by citizens. As we mentioned, the work of the Know-How Institute, identifying the optimal know-how and communicating with society and politicians on solutions for our policy making system costs funds. Furthermore, implementing the proposals against potentially obstinate governments or undemocratic interest groups might require the combined power and the joint support of the people on whose behalf the Know-How Institute works. All these actions need to be put on a sound platform, for them to be effective. To organize these measures, citizens of democratic nations or those aspiring to set a functioning democracy up should join in an initiative, a Citizens’ Organization controlling and shaping their policy making system. Again, a democratic policy making system can only work effectively with effective control. This is the second step to which the Economist could be contributing, if they want to make democracy work. What we have discussed here is simply rational: No systems works without effective control. In a democracy the stakeholders, the citizens themselves need to take an active role in exerting effective control, otherwise democracy will not work. In order to exert effective control, people need optimal know-how, they need to pool resources, and they need to join their individual power in an organization controlling the policy making system on their behalf. At present, the crucial role of the citizens in controlling their democratic policy making systems, the necessary parameters for effective citizen control and making democracy work, the interdependence between freedom, citizen engagement, and the outcome of the policy making system are not generally understood in society. A key reason is a lack of suitable citizenship education in our schools and a lack of exchange and communication on these matters later in life. Democracies around the world, also established democracies, are in a critical state. To make democracy work we need to establish a new culture of democratic citizenship. The third necessary action, the Economist could be contributing to, is to foster the creation of such a culture. The Economist could contribute to establishing a more effective citizenship education system at our schools, and also a system to communicate and educate people later in life on the need and the possibilities for their involvement as citizens. At this point we can mention only two effects the proposed concept will have. It probably has been known for decades or centuries, or perhaps since the inception of democracy that democracy does not necessarily generate leadership of the quality required to govern a country and the world. In his 2013 book “The Future” Al Gore repeatedly points out that we need better political leadership and steering to solve the urgent problems of our world such as global warming, increasing unemployment, hunger etc. If even Chinese observers, as the Economist writes, rightly formulate that democracy allows “certain sweet- talking politicians to mislead the people”, the question for us, the citizens in democracy, is why we do not finally take action to cure this deficit. Why do we not establish ways and means to ensure that our politicians have the required qualification profile and qualities to lead our societies in this complex world? If we create a Citizens’ Control Institution over the policy making system, we would actually have an effective process to take this issue on. A Citizens’ Control organization – or its Know-How Institute – could actually identify the necessary leadership qualifications our politicians must have. It could discuss with universities, what they need to teach politicians, so they contribute adequately to the qualification of the politicians in a society. Even if we were to take such measures to ensure the qualification of politicians, we still should not depend on the random and – by nature – limited qualifications of politicians (they are human beings like everybody else). We must establish effective systems and processes to ensure that in spite of the human shortcomings of our politicians also our overall policy making systems work as effectively as possible. A second benefit of the proposed system is that it offers a path for constructive engagement with democracy to all those who are dissatisfied with the performance of democratic political system. In many democracies people demonstrate against their politicians and governments. Discontentment partly leads to conflict, destruction, and loss of life. In some western democracies politicians think about forcing citizens, who are disenfranchised with their political systems, to vote. Protest and destruction do not make a democratic system more effective. Voting or even forcing people to vote will not improve the performance of the political system either. Improving a democratic system takes constructive steps as we sketched them. Setting up a new effective democratic policy making system or improving the performance of an existing system requires, as we suggested, know-how, resources, and power. To summarize: We need effective democracies to maintain our societies and our world in a good state. Generating such effective democracies requires setting up a know-how institute and effective citizen control. While, as we said, the Economist has probably a lot of assets to its credit which could help to make the necessary projects work, it is of course not only the Economist who should get involved in kick-starting these processes. Everybody in society, people and institutions concerned about the state of our world and the state of our democracies must join in. Of course, only those persons and institutions can get involved in a “Citizens’ Initiative for Better Democracy” who want to serve the Common Good, the well-being of all. Only if the organization truly pursues this goal will it generate trust and the support by wider society it requires. Only then will it be able to work as an effective citizen control system over the democratic policy making systems of a country. This entry was posted in Preconditions To Making Democracy Effective, Process and Model and tagged Action For Effective Democracy, Democracy, Discontent with Democracy, Effective Citizen Control, Effectiveness of Democracy, Leadership, Participation on March 12, 2014 by hpulrich.